So on Friday 19th May I gave a 30min talk on Mojo at the Journalism.co.uk conference News:Rewired in London. Can I say at this point that when I get embarrassed I turn a gentle shade of pink, however at this point I was a deep velvety crimson. Marc (again politely) took out his iPhone 4s and recorded a clip and then while speaking proceed to cover the speaker and microphone elements on the bottom of the iPhone, he then asked me to cover the headphone socket, which I did, albeit slightly incredulously. When he played the video clip back the audio showed no change when the mic and speaker on the bottom of the phone was covered but was almost mute when my finger was over the Headphone socket. He then pointed out the PINHOLE beside the headphone socket – which it turns out IS the video mic. For fear of suffering the humiliation of this epiphany a second time at some future date, as soon as I got home I tested the iPhone 5 – which remember has the headphone socket on the base, with the mic and speaker – and low and behold I discovered that on the iPhone 5 the video mic is in fact BETWEEN the lens and the led flash. So you see we can all be wrong and we can all learn something new everyday. Im just thankful that Marc chose to call me aside to teach me this valuable lesson and that someone else didn’t ask about this during the session. Im suitably humbled and better informed -Thank you Marc. I just got an iPhone 5s today, and what I just discovered and I don’t like, is that when shooting video I can’t do a running dialog with decent quality because my voice is directly behind the mic and phone now. With my 4s I could talk through as I shot something, and the voice would sound great because the mic placement better facilitated that. So I’m a big bummed with the new mic placement. It’s not like you’re getting great quality with the built in mics anyway, and now I constantly sound like I’m in another room. Oh well. 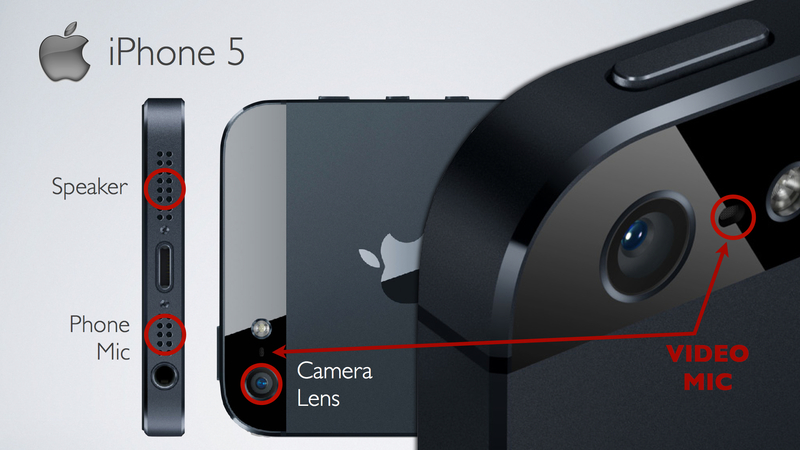 According to this site: http://www.finalpointlogic.com/?cat=5, the 5s has a third mic as well, co-located with the earphone speaker, and used for noise cancellation. Thought you’d want to know. Now I understand why my 4s is able to record a scene at a loud dance club better than my 5s. My 5s sounds blown and scratchy. Is there a way to work around it so my 5s can record as well as my 4s? Or do you think the problem I am having with my 5s is something else. I enjoy EDM concerts, but can’t stand the audio from my videos. Pls email me if you know a workaround that doesn’t involve carrying an external mic.